We will work with schools, churches, girl/boy scouts and other organizations to run book drives throughout the year for (GCH). We will coordinate groups to work with ConKerr Cancer to have child themed pillowcases made and designated to the children that are in patient at Golisano Children's Hospital (GCH). We will provide a "Movie Matinee Memory" at Destiny USA for the current patients of (GCH) and their families. We will work with the Radiation Oncology department and provide the painting of their Radiation Masks that the children use during their treatment. 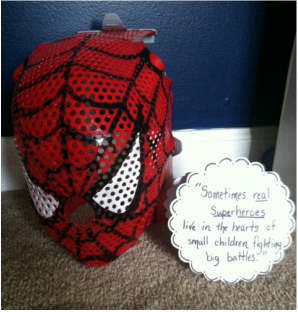 They can celebrate the end of their treatment by having a local artist turn their Radiation Mask into their own hero. I said, "Breast Cancer Awareness started in a small little town somewhere, years ago, with a group of dedicated people and look at how far it has gone." I told her I believe that yes we will start it in our little community and with those that are close to us but it's GOING to catch on. We will do great things with this organization, I believe it with all my heart that we WILL make a difference, we WILL bring awareness, we WILL help fund research and be part of giving other children more hope, more support and most importantly, more options to fight and BEAT their cancer. I can only hope today this caring bridge journal finds a soft spot in your heart, and that you stand up for the children.... stand up for their right to live long healthy lives.. and when something interferes with that, we as a community, we as a Nation stand by these children with confidence we have provided them with every possibility to beat their cancer.